Cons: Not cheap as a laptop but cheaper than buying tablet and laptop separately - RAM perhaps could have been 8GB rather than 4GB. Asus TX300CA-DH71 the Transformer book is in the dual function laptops category that Asus is an expert in. 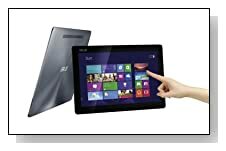 It is a very powerful, solid, sturdy and well-built device as compared to other many Windows 8 detachables out there. • This Asus detachable comes with a 1.9 GHz 'Ivy Bridge' intel Core i7-3517U dual-core processor and 4GB of RAM so you won't have any speed problems when you are doing many tasks at once. 128GB Solid State Drive is more than enough for the tablet- actually provides very fast and powerful performance and when you connect it to the keyboard and use the system as a laptop you will have both the 500GB hard drive and the 128 GB SSD. So just perfect! • Full HD crystal clear and sharp display - 1920 x 1080 resolution in a 13.3 inch is awesome as a tablet. Viewing angles are also great with the IPS panel. Front facing HD Webcam and a 5 megapixel video/still camera on the back are also part of the package. • The Transformer Book comes with a total of 4 stereo speakers installed on both tablet and keyboard. Sound is really good for a 13" laptop but the volume doesn't go too high. • Slim and backlit, so you can work comfortably in dim light.Typing on this well-designed keyboard is simply a lot of fun. • Connecting part between laptop and tablet is very solid, once you place the tablet into the keyboard, it holds it very tightly. You will just need to make sure that you save and close all your open files before detaching the screen. • Asus Transformer Book's battery life is well above average as you will find a second nonremovable 5,000 mAh battery on the tablet, as well as the 3,120 mAh battery on the keyboard. It usually lasts up to 8 hours as an ultra book and almost 5 hours as a tablet. • At a combined 4.2 pound weight (2.1 each for tablet and keyboard sections) it is naturally a little heavier than your common ultrabooks in the market. Also heavier and bulkier as a tablet than other tablets but it is well worth it for the extra screen size, storage and performance. • Asus TX300CA-DH71 is not cheap as a tablet but certainly costs less than buying a tablet and a notebook separately and it is more interesting as a concept and very convenient too. Conclusion: Flexible- both a tablet and a laptop, powerful with an i7 dual core processor, fast and great for multitasking, 4GB RAM is plenty but an 8GB could have been better, plenty of storage space, sharp and bright screen, great audio quality, cheaper than buying tablet and laptop separately and ASUS is one of the best laptop producers anyway. So we would highly recommend this model to anyone planning to buy a detachable transformer book.